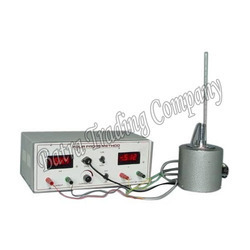 We are engaged in manufacturing and supplying Hall Effect Trainer Kit. The kits offered by us are developed in accordance with the guidelines laid in the industry by our team of engineers. Used for various industrial purposes, the offered kits are available in different specifications. 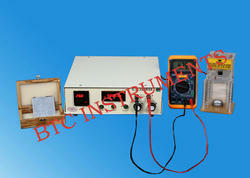 BTC Instruments made four Probe apparatus is used to measure the reisitivity & energy band gap of Crystal. Ø Measurement of resistivity of semiconductor by four probe method. 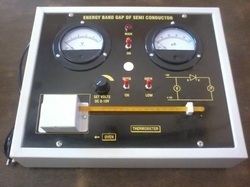 Ø Determination of Energy Band Gap. 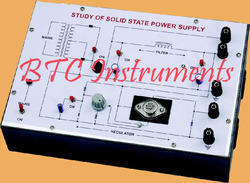 BTC instrument make consists of power supply for g. M. Tube with digital readout meter. 6 digit counting system with its power supply. Controls for reset, start & stop through in panel. One presentable timer with 3 digit display & thumb wheel switch. Complete with g. M. Tube stand & one radio active source b.
Experimentation with Semiconductor Energy Band Gap Measurement introduces you to a very useful nonlinear electronic device: “diode”. This product familiarizes the characterstics and the energy band gap of Germanium semiconductor diode. Semiconductor diode is an important element of most electronic devices and plays an essential role in modern technology, because of its relevant conductivity. This product provides the crucial framework, which needs to understand the concept of an energy band gap and characteristic of a diode. Conductivity is directly related to energy bands and it is necessary for any detailed description of Semiconductor devices. 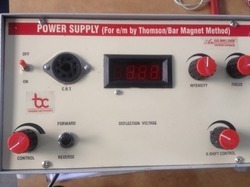 The apparatus is designed to work on 230volts AC 50c/s. It has built in E.H.T. supply. New Cathode Ray tube is used to provide proper display. Very easy to handle and Compact in size. (a) Efficiency of various types (Ripples) of filters - T type etc. Ionization Potential Mercury - To draw V-I Characteristcs of Thyratron valve and to drive Ionization Potential of DC Power Supply 0-3 VDC/50mA & AC 6.3V 0 to 25V 500mA, two meters for voltage & current measurement, valve diagram is Printed on Front panel, connections of Supplies & Valve brought terminals. Single unit having EHT power supply inbuilt and hydrogen tube holder/stand. As you conveniently mount the spectrum tubes into the spring-loaded holders and energize them, a specially designed shield holds the tube firmly while preventing you from touching the electrodes. A black metal panel behind the tube eliminates distracting ambient light and protects the tube from breakage. Being the market leader, we are actively devoted towards providing well tested Fiber Optic Trainer that is used in institute for education purposes. 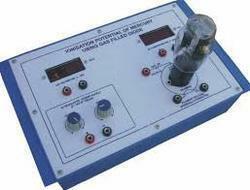 To ensure quality and functioning, this instrument is strictly tested on various parameters by our quality auditors. Also, clients can avail this fiber optic trainer from us in many technical specifications at reasonable price within stipulated time frame. Looking for Solid State physics ?